A crowd of women, men and children calling for comprehensive immigration reform marched, on Monday, February 24, 2013, from the Metropolitan Detention Center in Downtown Los Angeles to City Hall to launch the “Fast for Families Across America” bus tour, a campaign to take the issue of comprehensive immigration reform to more than 75 congressional districts across the United States of America. 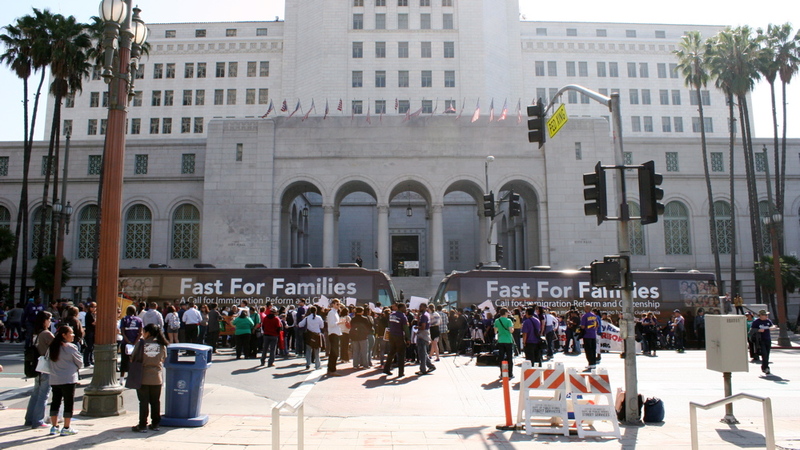 With twin “Fast For Families” buses as their backdrop and news media cameras in front of them, the crowd was represented by a lineup of speakers which included Lisa Sharon Harper (Sojourners), Dae Joong “DJ” Yoon (NAKASEC), Congresswoman Judy Chu, and Eliseo Medina who spoke of comprehensive immigration reform as a pressing issue of the present. Bishop Minerva G. Carcaño, Los Angeles Area Resident Bishop, also spoke in support of the initiative, naming the issue of comprehensive immigration reform as one of morality and not as an issue of partisan politics. 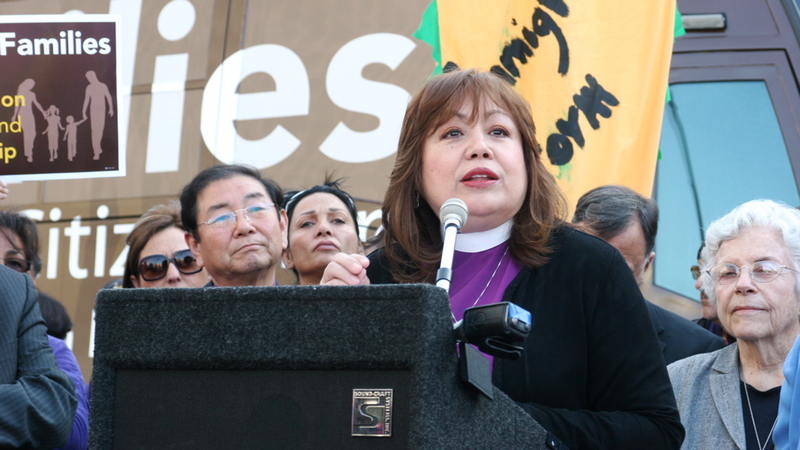 In particular, Bishop Carcaño mentioned her participation in civil disobedience to call for the Obama Administration to end deportations by executive power, not by an act of Congress, as an example of how both neither Democrats nor Republicans have displayed principled leadership on matters relating to immigration. To end the event, faith leaders were asked to bless those who would get on the buses and embark on the campaign. Rev. 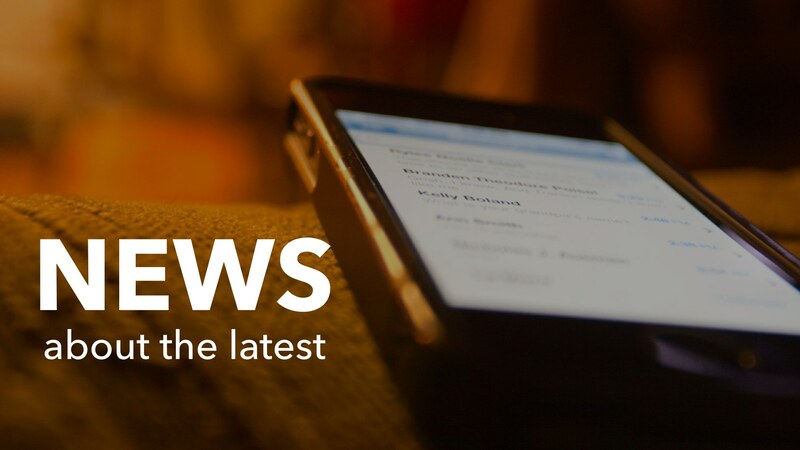 Jennifer Gutierrez, Cal-Pac Interim Director of Justice and Compassion Ministries, and Rev. Sandie Richards, Senior Pastor of First United Methodist Church of Los Angeles, each blessed the riders with a prayer at the microphone. And, Rev. 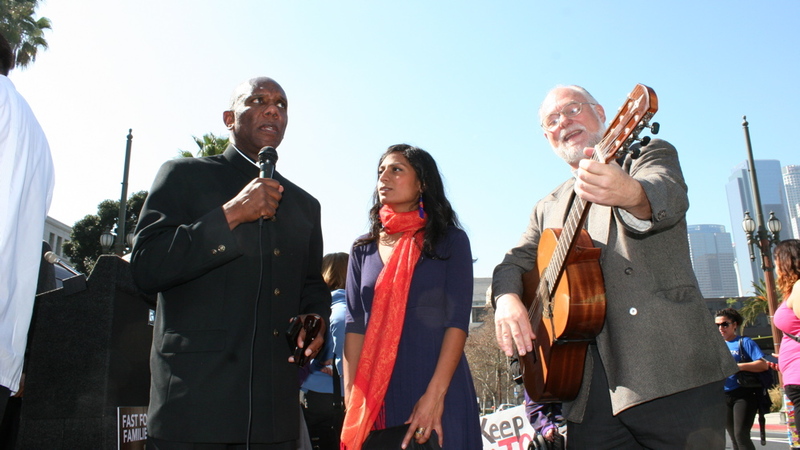 David Farley, Senior Pastor of Echo Park United Methodist Church, made sure that those present would leave with the sounds of his guitar as well as the singing of leaders from Clergy and Laity United for Economic Justice (CLUE-LA).